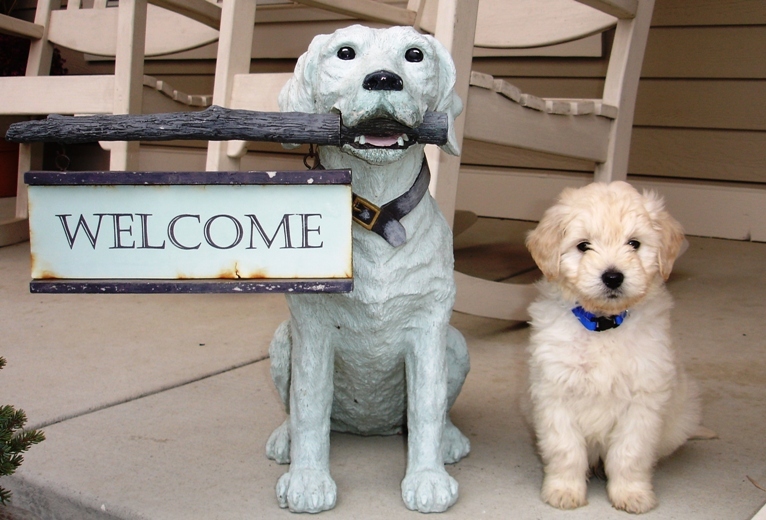 Huckleberry Kennels -- Home of Great Goldendoodles and Mini Goldendoodles! Hello there, glad you came by. Huckleberry Kennels is located about an hour north of Spokane, Washington in the small town of Chewelah. Our 60 acre farm is in the Huckleberry mountain range. We have been breeding and raising Golden Retrievers for about 15 years. We love the breed for many reasons but decided to add a little color to our lives and began to research dogs to find another kind of dog that would fit into our family. We had a tough criteria to fill. We wanted a dog we could trust with our small children and our special needs daughter. Steve has allergy issues that had to be considered and we couldn’t give up the gentle spirit of the Golden. After researching many different types and sizes of dogs we fell for the Standard Poodle. The Standard poodle is nothing like a the smaller poodle in temperament or gentleness. Then after some more research we discovered the “DOODLE”! Now we have the best of both worlds, Smart retrievers that don’t shed and they come in COLORS. So now we can have the best of all the dogs Golden Retrievers, Standard Poodles and “Doodles”.